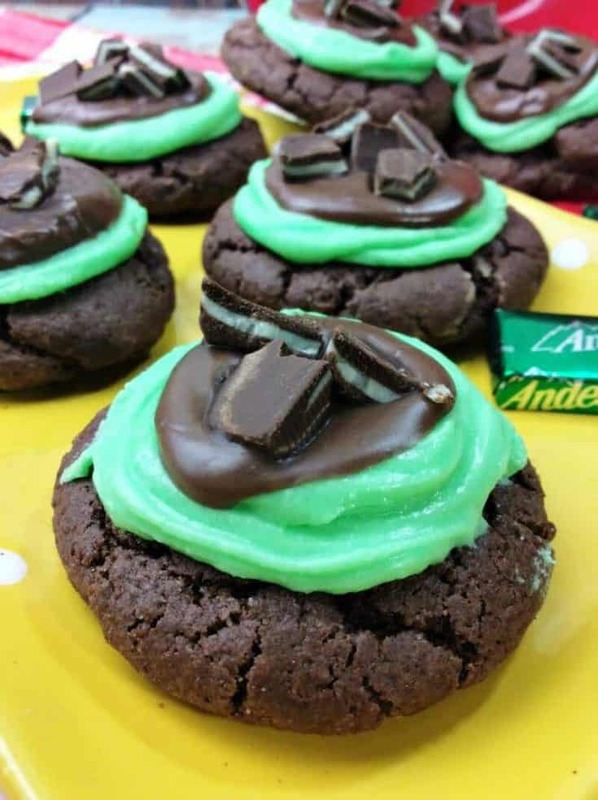 These Andes Mint cookies pack a perfect flavor combination of chocolate and mint that will put all other chocolate mint cookies to shame. Do you love the flavor combination of chocolate and mint? What about Grasshopper cookies and Thin Mints? I love them all. I can't get enough of that chocolate mint goodness. That is why I am going crazy for this amazing Andes Mint cookies. These cookies seriously are the best. 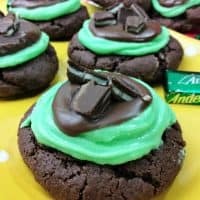 These Andes Mint Grasshopper Cookies are a must for anyone that loves to get in the kitchen and bake. From the cookies to the frosting, everything in this recipe is made from scratch. 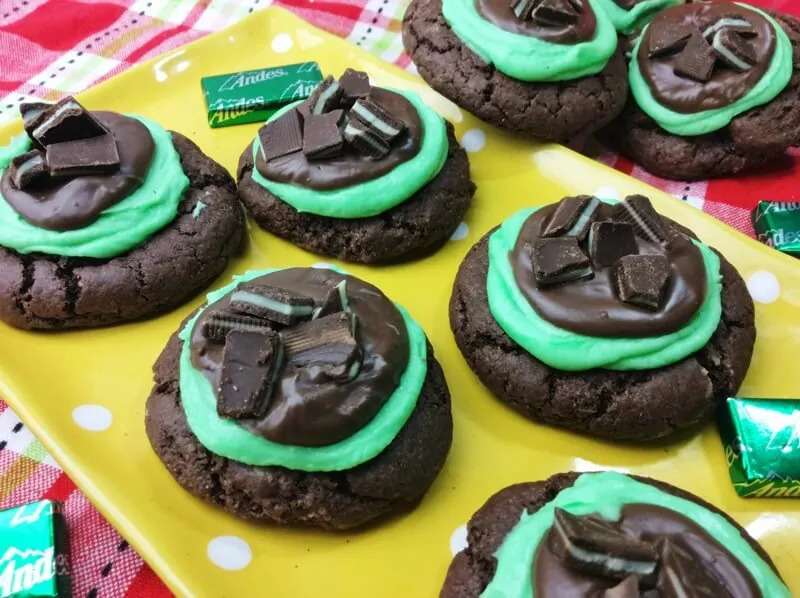 The mint chocolate cookies feature pieces of delicious Andes Mints and are topped with mint flavored frosting, chocolate, and more Andes Mints. They are just packed with yumminess. Once you clean the drool off your keyboard, head to the store to get the ingredients you'll need and get baking. Chances are you'll be making these cookies over and over again. 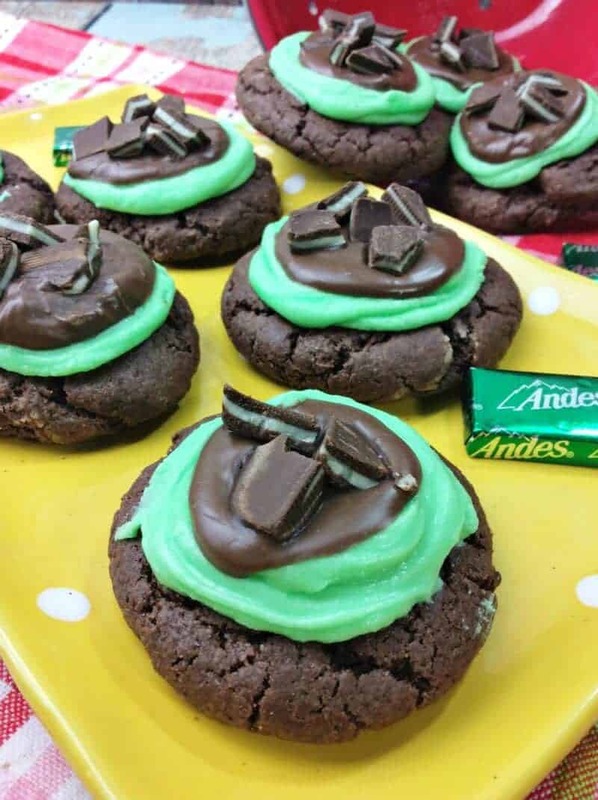 The bright green icing makes these mint-chocolatey Andes Mint Grasshopper Cookies a perfect St. Patrick's Day treat. Additionally, these tasty cookies are a great treat for your holiday cookie exchange. Honestly, these cookies are certain to be a big hit any time of year. Preheat oven to 375 degrees. While oveN heats, line a cookie sheet with parchment paper and unwrap 1/3 of the Andre Mints and chop into small pieces. Whisk together flour, cocoa powder, and baking soda. Set aside. Using an electric mixer, beat both sugars and butter in a large bowl until smooth and creamy. Add vanilla and eggs; beating well. Slowly add flour mixture one tablespoon at a time, stirring well. Stir in the chopped Andre mint candy pieces. Using a small ice cream scoop measure out dough for each cookie. Place dough onto the lined cookie sheet, about 2 inches apart. Bake for 7-10 minutes or until cookie is slightly cracked. Allow the cookies to cool on cookie sheet for about 2 minutes before transferring to a wire rack to cool completely. Using a stand mixer, cream the butter with 1 1/3 cup powdered sugar. Slowly add the mint extract, 2 tbsp milk, and the rest of the powder sugar into the bowl. Blend well. Gradually add one tablespoon of milk at a time until the desired consistency is reached. Spread a thick layer of frosting on each cookie. Set aside. Chop the remaining Andre Mints in half. Set aside. Using a double boiler, stirring constantly, melt the chocolate wafers. Set aside to cool slightly. After the melted chocolate has cooled/thickened slightly place a dollop on top of each cookie using a tablespoon. Top each cookie with the cut halves of the Andre Mint candies. I hope you enjoyed this tasty recipe! Be sure to let us know in the comments below how yours come out if you decide to give the recipe a try! Oh my! These look delicious! Thank you for sharing. We are going to have to give them a try. This is one of my favorite recipes. 🙂 I love these mints soooo much. Oh My. These look delicious. My grandkids would love these. We will have to give them a try. This is a delicious recipe. I love the combination of chocolate and mint. 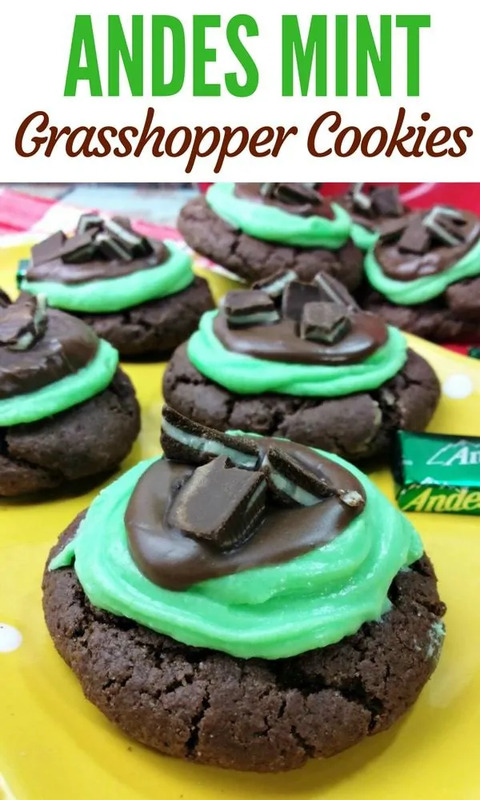 These look so decadent and really perfect for any occasion but especially for Saint Patrick’s Day.Thans for the awesome post. I love Ande’s Mints! It’s been a few years since I’ve seen them at the store, I normally avoid the candy aisle because I have no control. LOL But oh these cookies look so good! I’m going to break down & take a stroll down that forbidden aisle and make these for my siblings. Pinned the recipe so I don’t lose it, Thank you so much!! Great cookie recipe for chocolate and mint, love homemade cookies, these look so appealing. Andes mints are my favorite #! These cookies are to die for#! Thank you for recipe!! The combination though ? i’m not sure if i’d be able to bake it,but i’d definitely give it a try ? I can’t wait to make these cookies! My grandma made a “famous” grasshopper pie that we all loved! In my mind these will be very similar! Thank you! YUM!! Andes are my favorite so these cookies sound absolutely delicious! I love the color combination too, they are so pretty! 🙂 Thank you so much for sharing your recipe.